I was unexpectedly invited to Brooklyn’s Taste Talks early this Fall via OpenTable. I have been fortunate through my previous work to have been to a number of food events but it was for the first time and hopefully not my last through my work as a foodblogger where I was invited to a food event. Taste Talks is a weekend festival celebrating New York City food culture and media. I was only able to attend the second portion, the All-star BBQ at the East River State Park. It was a nicely organized group of intriguing chefs and restaurants currently in New York City. Each chef participant exhibit their interpretation of barbeque. My favorites were from Chef Ivan Orkin from Ivan Ramen- grilled duck hearts, Chef Jonathan Wu from Fung Tu – Pig head salad and Chef Rob Newton from Nightingale 9 – barbeque duck which all had an Asian inspired touch to their dishes. Moving out from my parents has been the biggest step. To celebrate this milestone, I took my parents to Maialino for a 3-course lunch during restaurant week. It was by far one of the best restaurant for restaurant week I have been to and a great spot to bring parents to. My dad being a retired chef / restuaurant owner and my mom, a vegetarian, homecook but somehow still manage to season meat dishes really well are both really hard to please when it comes to dining out. Maialino, nailed it. The ambiance of the restaurant was appropriate and service was exceptional. The food by executive chef Nick Anderer is rustic, refined Italian and the olive oil cake is a must. It is why Danny Meyer’s restaurants continues to have the reputation and the respect the food industry has for him as a restauranteur and his team’s craft. Alphabet City remains to be a less known part of Manhattan or a part we recalled in the musical Rent. Tompkins Square Park for instance has transformed to a dog loving park and the neighborhood is home to many community gardens and the new St.Mark’s bookstore. It is also a neighborhood with a couple of awesome fried chicken options. I discovered Bobwhite Lunch & Supper Counter while on the elevator. The restaurant is very small with limited seating but the bar counter is my preferred spot, even with a group of friends. They have a fried chicken supper for four that includes sides and biscuits. A low key spot and has quickly become a favorite of mine in a new neighborhood I am excited to call home. For cheap eats in New York City, you can always count on Chinatown. One of my favorite cuisine is Vietnamese for a bowl of pho, sandwiches, or spring rolls. For a very long time, Thai Son was my go to spot until I stepped foot into Cong Ly one day and since then haven’t been anywhere else. It is a family owned spot and a restaurant you can linger as long as desired over a bowl of pho. Other than their configuration of tables, which I am tempted to rearrange, the food is delicious, inexpensive and comforting. I made a few visits to Bakeri this year. A small café in Williamsburg, Brooklyn with an assortment of cookies, freshly baked rustic breads, pastries and several savory options. The décor of the café and choices of ceramics and silverwares is one of many reasons why I keep going back but mainly because of their lavender shortbread paired with a cup of latte – every girl and gent treat. Bakeri has since expanded a second location in Greenpoint, which I have yet to visit. In the meantime, it is worth heading across the East River. This year marked my 10 years High School reunion, in addition to an impromptu mini middle school reunion at the Lobster Joint on the Lower East Side. After 14 years, it’s amazing to reunite with friends and to be able to casually catch up where we left off. The Lobster Joint on the Lower East Side sadly recently closed but their Greenpoint location remains open. It had a great happy hour with a wide selection of beer, wine, and affordable, pretty delicious fried oysters, shrimps and lobster rolls sliders. It will be missed. World Cup and barbeque at Red Hook’s Hometown doesn’t get any better on a hot summer day and is how we celebrate Father’s day. The place is only a ferry ride away from Lower Manhattan and a few blocks from Ikea. Hometown Barbeque is as good as any Southern, Texas barbeque and the food is presented on butcher paper, the authentic way. For dessert, save room and head over to Steve’s Authentic Key Lime Pie. The graham cracker crust and the amount of citrus is a nice complement after a heavy barbeque meal. Two is better than one. 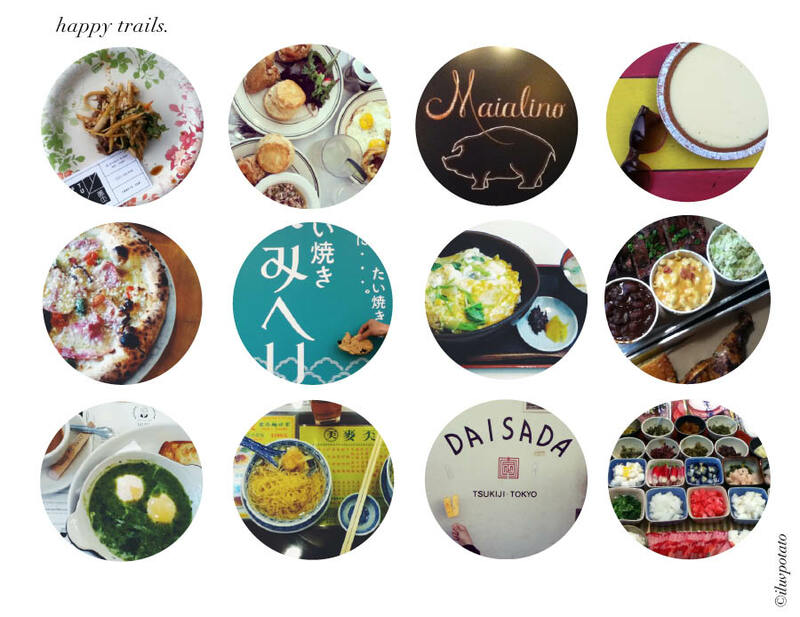 Some of the sister restaurants I went to this year included: Freeman’s + Isa and The Fat Radish + The East Pole. Rosemary also opened Claudette, which will be on my list for 2015. Read more on my review on some of the listed restaurants on Brunch. Buttermilk Channel has a cult following and it is likely to be busy even on a rainy, Monday evening which is when I went. On the contrary their sister restaurant, French Louie is far more mellow. The outdoor backyard dining space is probably the reason why I would go back. It is hard to believe it is Brooklyn because it’s damn pretty. It has been over twenty years since I have been to Hong Kong and the city is glowing and the food culture is astounding. Sorry New York City, but Hong Kong is the new city that never sleeps because its non-stop eating. Mak’s Noodle is an example of what a Michelin Star restaurant taste like without a need for reservation and without splurging. With only a few items on the menu, the wonton noodle soup is the signature dish. The wontons are silky with the perfect ratio of shrimp to pork filling and the handmade noodles are refined submerged in a tasty broth. The bowls are petite but ultimately satisfying. In the heart of Kyoto, Japan, Nishiki Market is a long strip of various food vendors or also known as food heaven. A taste of everything Kyoto has to offer and surprisingly the best pickles and fermented food I have ever had. There are specialty items to take home and small bites like tofu doughnuts, soymilk ice cream, onigiri, octopus on skewers, rice crackers, and all the samples you can indulge on. I miss the warm welcome of irasshaimase and the hospitality of the Japanese culture. More on Japan in a future post. The Hong Kong Airport food court is amazing. On our way back to New York City from Japan, we had a layover at the Hong Kong airport and enough time to eat some more delicious Cantonese Chinese food. The challenging part is narrowing down to which one. The Hainese chicken rice dish and Penang style rice noodles was unlike anything I had in an airport and frankly with the limited amount of days spent in Hong Kong, it was one of the best meals we had. Summer went by far too quick this year. At one point I was juggling 4 projects and finalizing the apartment was very stressful. One fun activity I did manage to pull together with the help of my sister was an outdoor vegetarian friendly picnic. I made a mushroom, asparagus quiche, quinoa kale salad, a platter of crudités with garlic labneh and pita and homemade lemonade. I have a long way and a lot work to do to become a professional chef and have no means or interest in becoming a chef. What I find most satisfying and joy is creating the menus, preparation and organization aspect. The picnic was a preview of what I am sure will be more of in 2015 – potlucks, picnics, and gatherings. More news on that next Spring. “Without effort nothing is achieved.” Food keeps me going, it’s an endless discovery and I am excited to start a new chapter in my new home in this diverse city where you don’t have to travel far to get a bowl of ramen and a lox bagel. As always, thanks to those who shared a meal, their positive energy, laughter, tears, words of wisdom and the kind support from readers, making 2014 a memorable year. Happy trails and to a fruitful New Year! I had the privilege to talk to second grade students for career day at a public school about my profession earlier this week. My friend, a teacher at the school who invited me thought I was a full time foodblooger and did not know that I actually have a full time job ( here ) Foodblogging is my side gig or more of a portfolio of my dining adventures. It would be difficult to sustain on one post a year and to be self-employed. I don’t think I have that kind of discipline yet and occasionally need a push and someone to motivate me, so thank you to everyone who has been following me and for reading my posts over the last several years! Also to those who shared their appetites with me. M. Wells Dinette /// I regret never having the chance to eat at the original M. Wells in Long Island City, closed due to increasingly high rent in the lease renewal, a common New York City story these days which is a pity. But Chef Hugue Dufour remain unstoppable and collaborated with PS1 MoMA with a comeback, M.Wells Dinette which is a perfect pairing. The interior of M.Wells Dinette resembles a classroom as a homage to PS1 MoMA former existence as a public school and similarly it is reflected on the menu, innovative and whimsical. The best dish was the guanciale salad with layers of unexpected flavors, textures and colors. It’s beyond an average salad but a thought out work of art. Fort Defiance /// Red Hook was one of the many hard hit neighborhoods during Super Storm Sandy. For my friend’s birthday, we decided to support a local business in the area. Fort Defiance is a bit off the beaten path but an insider tip is on the weekend, take the free Ikea water taxi from Pier 11 in Lower Manhattan to Brooklyn and walk from there. It will save you the metrocard fee and the weekend train suspension headache while absorbing in the New York City scape with a bit of escape. The menu is heavily Southern influenced with careful sourcing of ingredients where farms are identified. I had the Huevos Rancheros and it came with two sunny side eggs with a dollop of sour cream – oh my! The chili base with pork jowl was hearty and decadent. It was spot on for a March snow day. Buvette /// One of my favorite dishes is a cassoulet, which is a Southern French traditional one pot dish with beans, meats, sausages and duck confit. Buvette located in a charming part of New York City tucked in the West Village operates practically 24 hours from 8am breakfast to noon lunch and from early supper to 2am midnight snack. It’s how all restaurants, cafes and bars should open until the wee hours as those are the most magical in New York City. What I admire is the decor and the aesthetic of the restaurant / cafe and how much a little restaurant can do as seen on their instagram. The tartines and coffee is superb. Peels /// Voted for the best bloody mary’s is what drew my friend and I here for celebratory reasons. Not sure who awarded Peels for that title instead I vote Peels for the best shrimp and grits! Bowery Street in the last decade has transformed drastically with hotels, museum, galleries and a future home to Anthropologie. I certainly do not miss the tumbleweed, mobbed with drug addicts/ homeless days on the Bowery. Peels is a nice addition to the Bowery’s restaurant scene and with a Southern themed menu with their signature biscuits. The shrimp and grits melts in your mouth with the right seasoning and flavors. It’s also very photogenic. The Hungarian Pastry Shop /// There are the iconic dining scenes when visiting a city or a neighborhood and for the Upper West Side, near Columbia University would have to be The Hungarian Pastry Shop. It’s a bustling cafe with tourists, students from C.U, bikers and people like me who is catching up with a friend in the area who recommended the place. I love the energy of this cafe where the waitstaff yells out your name. Though, up by the counter is where heaven is calling with assortment of pastries. A no fuss hot brewed coffee with an apple strudel and flaky napoleon dusted with confectionery sugar… O-M-G! I’m positive I will be back again. Momofuku Noodle Bar Fried Chicken /// My guests from out of town asked, “so what do people do in New York City during Memorial day weekend?” Well, we dine out! Momofuku Noodle Bar the very first of Chef David Chang’s Momofuku restaurant empire started a group dining experience for 4-8 people for the fried chicken dinner. With very odd hours available, I manage to make reservations for the Saturday of Memorial weekend. People treated the restaurant as if an amusement park, waiting patiently in line for the restaurant to open at noon. The fried chicken meal is created to feel very exclusive as we were the only ones who had a butcher paper covering our table. It is two whole chickens made two ways, one Southern fried chicken and the second Korean fried chicken. I have to admit I was a little disappointed by the fried chicken …yes, disappointed. But what made Momofuku Noodle Bar Fried Chicken stand apart is the condiments from hoisin / plum sauce, jalapeno, gochujang and my favorite ginger green onions in oil…mmm. Also a bowl of greenmarket bib lettuce, radishes, carrots, mints and an insulated plate of mooshu pancakes. What I liked about it was it encouraged diner to play with the food and to be creative with multiple combination in eating the fried chicken and there is no wrong way. “Why do you love your job?” One of the students asked. A very simple answer: food! Everyone has to eat regardless of the economy and it’s an exciting time for those in the industry and as diners, especially in New York City. The latest best adaption from the West Coast is not just any cup of coffee but Blue Bottle coffee in Williamsburg, Brooklyn. Blue Bottle Coffee Bar & Roaster opened a New York City location in Spring 2010. Originated from San Francisco and established their business from the Ferry Plaza Farmer’s market. I had revolved our day trip with the mission of getting a cup of drip brewed from Blue Bottle Coffee with the company of my hot yoga and food enthusiast friend, Cynthia Wang. 10.16.2010 (11:00am) : Cynthia and I met at the the Hester Street Fair for the New York Magazine Grub Street Food Festival. Located in the Lower East Side, this very jam packed event celebrated local New York City chefs, restaurants and small food business around the 5 boroughs. 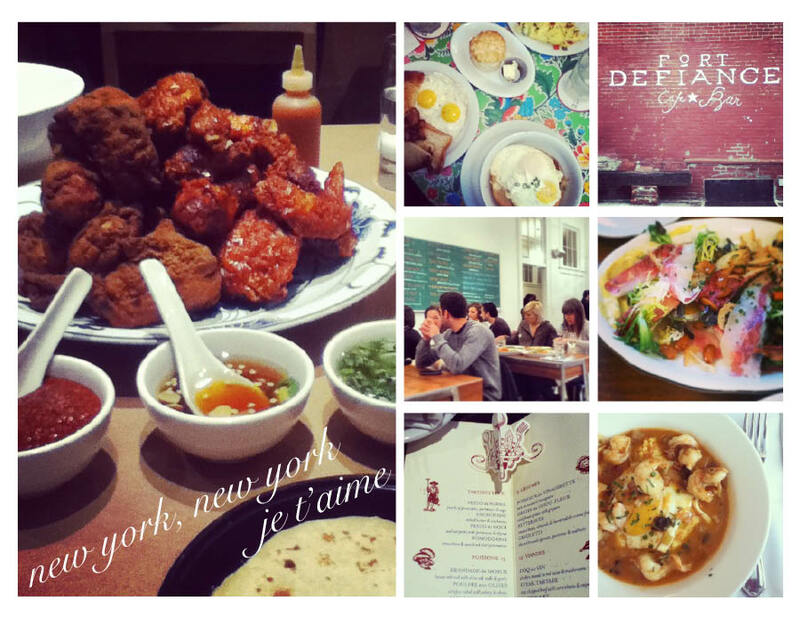 With over 30 food vendors from Brooklyn, Kickstand Coffee & Pies n’ Thighs to Lower East Side, Pain D’ Avignon & An Choi. So many mouth watering choices. What caught our eyes and appetite was first Nijiya Market presenting The Rook, a Japanese gourmet catering serving taiyaki, a Japanese pancake traditionally with red bean paste ($3). The Rook was serving unusual fillings this included: cheese & olive oil and red bean & cream cheese. They were pouring the pancake batter over a beautiful cast iron fish mold and in few minutes added fillings to a batch with sausage & cheese in which is what we had. It’s definitely a children’s favorite and a nostalgic treat for adults. One of the best things eaten at the Grub Street Food Festival, Cynthia and I agree is Il Buco’s Panna Cotta with aged balsamic vinegarette (for only $1) Panna cotta is essentially a pudding in Italian with cream, milk, sugar and gelatin. Il Buco’s panna cotta was creamy in texture and the balsamic vinegarette, the tart and tangy contrast nicely with the semi-sweetness of the panna cotta. I can eat several of these. There were plenty of samples around like bacon marmalade from literally they stand by their name and call themselves Bacon Marmalade to An Choi’s pickled pigs ears which was deliciously seasoned. While coming in we spotted these beautiful handmade twisted pretzel from Sigmund Pretzelshop. Cynthia and I shared a truffle oil cheddar cheese pretzel ($3) with homemade mustard seed and beet sauce on the side. As beautiful as the pretzels looked, the pretzels were absolutely fresh, the mustard sauce out shined the pretzel. Finally, we settled for Purple Yam for lunch. Long lines for this particular food vendor is always a sign of good food. Purple Yam a Filipino restaurant in Brooklyn was serving a Filipino kind of soul food, chicken and ribs in a signature apple vinegar marinade and sauce over what more appropriate than purple rice ($5). The Philippines known for their roasted pig, Lechon without a doubt the ribs was juicy and tender and the chicken meat both deboned nicely without any mess. Purple Yam was also serving a pork belly in steamed bun ($4) which the pork again is equally as delicious as David Chang’s pork buns from Momofuku Ssams Bar. 12:30pm: With our tummy filled we made our way to Pier 11 to catch a ferry ride to Red Hook, Brooklyn. Free, courtesy of Ikea. Before the ferry ride, we made a beverage detour at a Chinese cafe on Allen Street. Cynthia was struck by the idea of boiled Coca Cola with ginger and lemon she decided to have one. Apparently, hot Coca Cola with ginger and lemon is a remedy for preventing a cold or to fight a cold, FYI. We caught the 1pm ferry and arrived to Added-Value, a Redhook Farm for their Halloween Harvest with fresh produce for sale all locally grown in Redhook, apples from Red Jacket Orchard, pumpkin picking, and a live band of blues. 2:00pm: We then took the free shuttle bus (courtesy of Ikea) to Smith & 9th Street to take the G train to make our way to Fort Greene, Brooklyn to do a little vintage goods browsing at the Brooklyn Flea. This outdoor flea market is one of the best in the city with many inspirational objects dated back to early 1900s. It’s a treasure for anyone who is looking to remodel their apartment to artist who needs some inspirational references or if you’re a little nostalgic a gift for someone to a treat for yourself. 4:45 pm: Our final destination, Blue Bottle Coffee Bar & Roaster in Williamsburg, Brooklyn. Located on 160 Berry Street, you can smell the coffee beans roast from a block away and this is a fact! The space used to be a garage and probably a warehouse of some sort but the interior space with only three bar seats and a standing counter top is elegant and edgy. Blue Bottle is not your typical coffee shop with big arm chairs and puffy couches, it is meant for a quick and snappy experience but you are of course more than welcome to stay to relax, most likely standing or if you’re lucky sit by the bar and be mesmerized as the barista pulls an espresso shot. There is a beautiful Siphon coffee brewed method on display and further back is an amazing space where Blue Bottle roast their own coffee on-site! The menu is very straightforward and as much as I wanted a latte or everything, I can only tolerate one cup of coffee during late afternoon. I chose the drip brewed coffee house blend ($2.75). The coffee is prepared individually from precise and accurate measurement in grams of coffee beans to grind and ratio to temperature of hot boiling water and is poured over the coffee grind and patiently drips through a Blue Bottle filter. An individually cup of brewed coffee roughly took less than 60 seconds. The aroma was fresh and the first sip was intensely bold and an instant awakening. Making Blue Bottle a worth while outer borough coffee destination. See my slide show, an adventurous day trip from Lower East Side to Red Hook to Fort Greene to Williamsburg and back to Lower East Side in all in 8 hours. Take this itinerary, just wear comfortable shoes.